AKA “Abercrombie and the Ultimate Anti-Heroes.”Here’s the short review: reading Best Served Cold is like being a guest judge on ‘Iron Chef America: Sardines.’ Sure, there’s some incredible stuff happening–but still… it’s sardines . And would you really want to eat like that every day? The long review: What’s good? 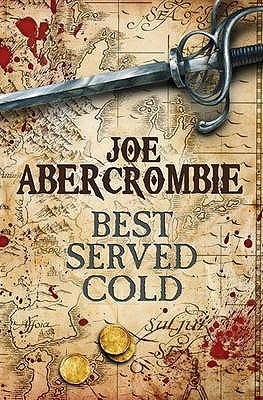 The writing, the world, the character description, the brilliant way Abercrombie links and weaves so many plots together, both large and small, and the tension he is able to build through the story even when the general outline is known (“seven deaths”). There were times I found myself saying, “now that was a fabulous sentence/paragraph/plot twist,” but I couldn’t tear myself away from reading long enough to take down a note or two. So we will all have to remain unsure which particular points struck me; what I remember is that they were there and there was more than one. One notable narrative device used to brilliant effect is in memory segments in the beginning of some chapters. The memory gives context an earlier event we’ve already heard rumors about or how it has given rise to particular actions. It results in a neat little bite of background to the rumors, character insight and world history. Overall, he achieves that rare writer’s groove where the reader stops to marvel, but not long enough to disengage from the story. The bad? Well, while it’s not done badly, truly none of the characters are very likeable. Caught in webs of their own weaving, and victims of their own pursuits, no one is very sympathetic. These are well-created characters that occasionally navigate their challenges with grace, and always with fortitude, but most often just use determination and brutality. If you’ve read The First Law series, and Abercrombie is hoping you have (as more than a few characters have first made appearances there), the main character, Monza, “The Butcher,” suffers overmuch from similarity to Inspector Glotka. The frequent references to her physical discomforts sounded a great deal like the words used to describe him, and I found myself feeling like a significant amount of her character-building was poached from him. Abercrombie writes that part of his personal challenge with this book was writing a lead female character, and perhaps because of Glokta, I just feel like he didn’t quite succeed. Four stars for literary excellence, but the brutality and lack of truly heroic characters will keep me from adding to my personal collection, and prevent me awarding full five-star awesomeness rating.